So I have a Beneteau 351 (35') with a non-functioning ST4000 mk2 autopilot (wheel drive). 1. If the wheel drive is functional, then theoretically I could use an ESC with openplotter to run it? As far as I can tell from the maintenance manual, the 4000Mk2 is literally just a 12v brushed DC motor. So the open plotter drive unit, or a regular ESC would work? How do you connect the ESC to the Pi? I assume the PWM inputs connect to the GPIO pins somehow? 2. The system has some type of rudder feedback unit, assume it was part of the ST4000 system. Anyone know what signal it's providing, and whether open plotter could use it? 3. In other forums, no one seems to talk about wheel drive autopilots, everyone talks about linear actuators. But a T0 actuator from B&G is like $1500, plus I see no easy way to mount it to the rudder. Is there a downside to wheel drive units? I'm new to this size boat and it seems like it's a good idea, but is it slower? less powerful maybe? not as good in rougher seas? 4. Is it worth trying to use the existing fluxgate compass? I just ordered a 9255 IMU for my Pi3, so I'm assuming that's going to be better? 5. Is there any way to leverage the ST4000 control head at the helm? I.e. does it output it's control signals as NMEA 0183? My open plotter does not have a sunlight readable display or weatherproof controller, so it's at the nav station. So how are you guys controlling the autopilot from above decks? 2. You definitely need rudder feedback. Again, Sean is the expert. on what works best. 3. There are lots of linear actuators out there. The trick is to find one with sufficient power, stroke and speed. Oh, and waterproof/marineized is pretty important. I have a Raymarine autopilot with an actuator on my Ben Oceanis 390. The actuator is HUGE. Think about going downwind in a following sea and how much your boat wants to round up. That energy you would would normally be putting on the wheel with muscle has to be provided by the autopilot system. So, do-able, but probably not cheap for the actuator. 4. Dunno if the 9255 would be enough. Should be, properly calibrated. 5. The ST4000 control head uses SeaTalk to output to the rest of the SeaTalk network, and the autopilot. The ST4000 control head has an NMEA input (for things like wind, bearing to waypoint, cross track error, etc.) but there isn't anything else you could use for input I suppose if you loved your control head, you could create a box that takes in SeaTalk and outputs to PyPilot. You could also just use a simple wireless keychain remote control, like you might use for a garage door opener. They are cheap and easy to set up. You don't necessarily need rudder feedback. Pypilot can tell when you hit the stops by monitoring motor current (maybe not the right word). That's the way my Autohelm did it anyway. But I expect the Raymarine rudder position is just a variable resistor and could be connected to your motor controller and only help things. You won't want to use the fluxgate compass. The IMU is cheap and much higher tech. The control head is probably not going to end up part of your solution. Most of us seem to be using VNC on a tablet to use the OpenCPN plugin. I noticed Sean has the OpenCPN plugins for Android on Google Play. That might be a little better. He's also discussed on here how to add an infrared remote control. I don't think it is built in like the stand alone pypilot. I do wish for more control options too. The WilhelmSK app on iOS has a Raymarine autopilot interface, why not pypilot? Maybe that could be interfaced. Sean talked about a potential Android app at one time. I don't want to lose the simplicity of a basic autopilot with its few big red buttons. 99% of the time I have no destination or route, I'm just sailing and want to hold the current course, go up a little, go down a little, and quickly take manual control. Isn't the "old" seatalk just NMEA0183? If so, then wouldn't the ST4000 commands be readable by open plotter if I had it connected to the NMEA0183 network? Even more advanced - I have a new B&G Zeus2 MFD that has autopilot controls... I assume that's putting out the control signals and getting input in NMEA2K? RPi3+ with openpilot, USB GPS, 9255 IMU, second WiFi dongle, ShipModul-3USB N2K. A boatload (pun intended) of N2K backbone cable and N2K t-block PCBs I designed and made myself. If someone handed you this jumble of stuff, what would you do? The Ben 351 is nicely setup for short-handed crew (1 or 2), but for that really needs at least a course hold via Autopilot... generally that will be it's use - me and my wife escaping the kids/world for the day/weekend. (04-17-2019, 12:23 PM)sjgharib Wrote: Isn't the "old" seatalk just NMEA0183? I would suggest to go by small steps, it is easyer to eliminate errors. is in Seans MOTOR.INO. It offers varios modes for motordrivers. No Ruderfeedback is needed, but it is advisable to have at least swiches for rudderlimits. It colud be reed contacts or mecanical end of travel switches. (I have them at the rudder quadrand) or have an motorcontroller wich reports overcurrent and stops then driving the rudder. I'm afraid not. Old SeaTalk is a 9-bit proprietary bus protocol. Thomas Knauf did a great job of reverse engineering the original SeaTalk several years ago. Here it is: http://www.thomasknauf.de/rap/seatalk2.htm. Some people have created devices that emulate SeaTalk, for example, to replace an AutoHelm control head. There are a few SeaTalk to NMEA converters out there that are single direction, SeaTalk -> NMEA, and one or two that actually go two ways. 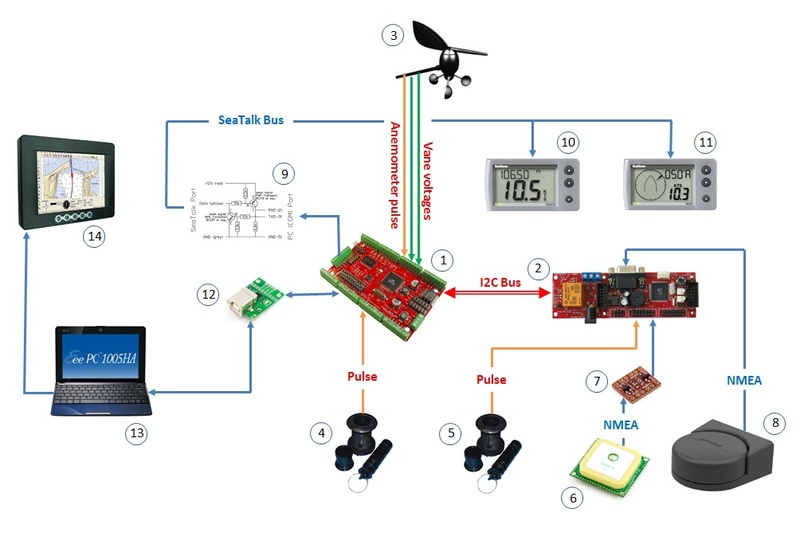 Unfortunately, these protocol converters take many of the SeaTalk command strings and encapsulate them in a unique NMEA 0183 string, as there isn't a corresponding NMEA string for many of the commands that are on the SeaTalk bus. I have an old ST-60 for depth and speed. In my case, I got one of the Quark-Elec SeaTalk to NMEA converters. It has wireless and USB output, as well as excellent AIS and GPS receivers. I figured the $120 or so I spent for that was a good deal compared to the time for me to build and troubleshoot all of the above, and it powers itself from the SeaTalk network. I'm in the process of adding an ultrasonic wind transducer, which I'll put directly into my RPI, and bring out NMEA to a Clipper Tactical Wind System display. If you want a dedicated display/control for your autohelm, you'll probably end up creating it yourself. As I said before, one of those little 433Mhz keychain remotes would be very easy to interface with a PI, which would give you four buttons that could be mapped to autopilot control. Something like this (but you won't need the relays) https://www.amazon.com/gp/product/B01CCSG2ZY. (04-17-2019, 01:02 PM)abarrow Wrote: I'm afraid not. Old SeaTalk is a 9-bit proprietary bus protocol. Thomas Knauf did a great job of reverse engineering the original SeaTalk several years ago. Here it is: http://www.thomasknauf.de/rap/seatalk2.htm. I don't like IR remotes, I'd love to get those little 4 button 433Mhz remotes working with Pypilot. I have that same relay board stuffed into my old AutoHelm controller. The remote hangs on a lanyard around my neck - it's a joy to be anywhere on the boat (say, on the foredeck with a flashlight) and adjust course. I don't even need to look at it. Would Openplotter Actions be a useful way to bridge whatever buttons one might want to use to ask Pypilot to change course? You guys are great - thanks for all the great information. That actually really changes my plan. I had assumed I could tie my ST60 into the zeus with the NMEA0183 connection, but now I need to re-think! Has anyone reverse engineered the sensors that feed the ST60 instruments? I.e., can I connect the signal wires from the depth, speed, and wind instruments to a "box" that would then output to SignalK, NMEA0183, or even NMEA2K? Then I could theoretically get rid of my ST instruments totally. (04-17-2019, 03:51 PM)sjgharib Wrote: You guys are great - thanks for all the great information. That actually really changes my plan. I had assumed I could tie my ST60 into the zeus with the NMEA0183 connection, but now I need to re-think!